German physician; born at Lissa, Austria, Nov. 7, 1832; died at Breslau, Prussian Silesia, Jan. 10, 1895; graduated (M.D.) from the University of Breslau in 1856. Gottstein devoted himself especially to diseases of the throat and ear, giving up his general practise in 1864. 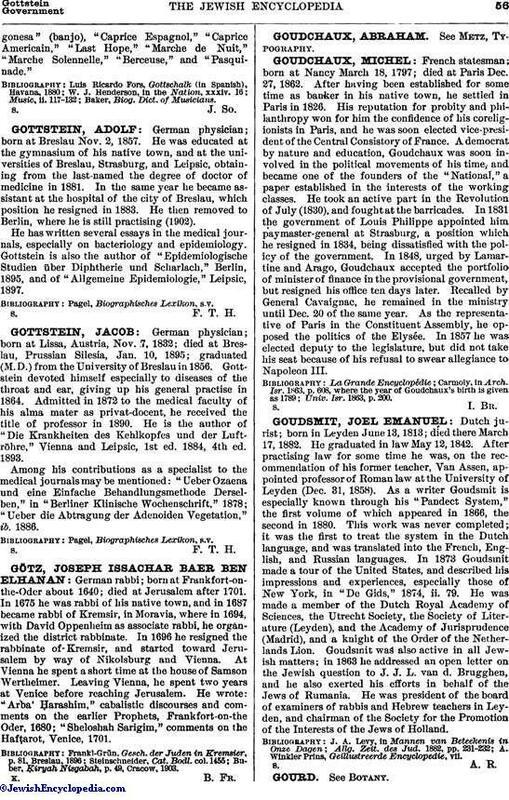 Admitted in 1872 to the medical faculty of his alma mater as privat-docent, he received the title of professor in 1890. He is the author of "Die Krankheiten des Kehlkopfes und der Luftröhre," Vienna and Leipsic, 1st ed. 1884, 4th ed. 1893. Among his contributions as a specialist to the medical journals may be mentioned: "Ueber Ozaena und eine Einfache Behandlungsmethode Derselben," in "Berliner Klinische Wochenschrift," 1878; "Ueber die Abtragung der Adenoiden Vegetation," ib. 1886.